So far in this series we've mainly concerned ourselves with a single resource that can't support distributed (or multi-entity) transactions. While that is becoming less common as NoSQL options, as Azure CosmosDB supports them, and with the 4.0 release, MongoDB now supports multi-document transactions. Firstly, there are many cases that even though transactions between disparate entities is possible, it may not be desired. We may have to make design or performance compromises to make it work, as the technology to perform multi-entity transactions will always add some overhead. Even in SQL-land, we still often need to worry about consistency, locks, concurrency, etc. 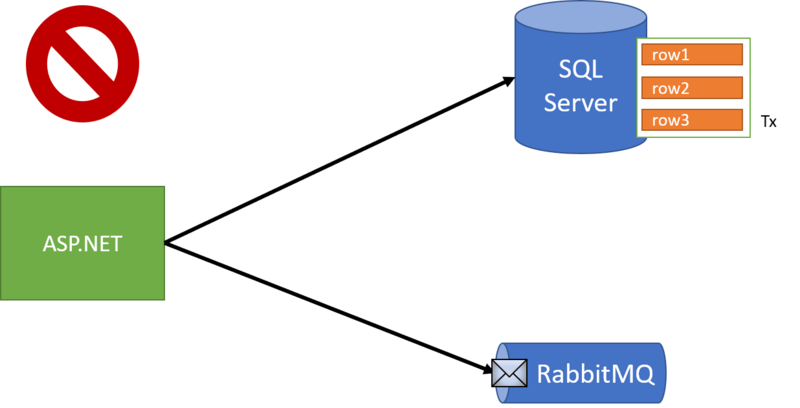 The code is rather innocuous - we're trying to do some stuff in a database, which IS transactional across multiple writes, but at the same time, try to write to a queue/broker/exchange like RabbitMQ/Azure Service Bus. While it may be easy/obvious to spot places where we're trying to incorporate external services into our business transactions, like APIs, it's not so obvious when it's infrastructure we do own and is transactional. 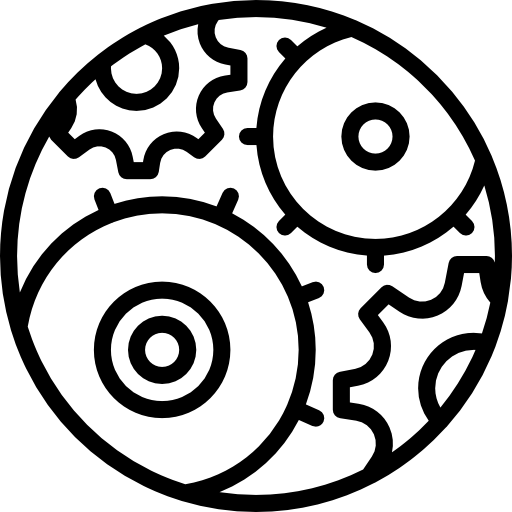 Ultimately, our solution will be the same, which is to apply the outbox pattern. With the Cosmos DB approach, we placed the outbox inside each individual document. This is because our transactional boundary is a single item in a single collection. In order to provide atomicity for "publishing" messages, we need to design our outbox to the same transactional scope as our business data. If the transactional scope is a single record, the outbox goes in that record. If the scope is the database, the outbox goes in the database. 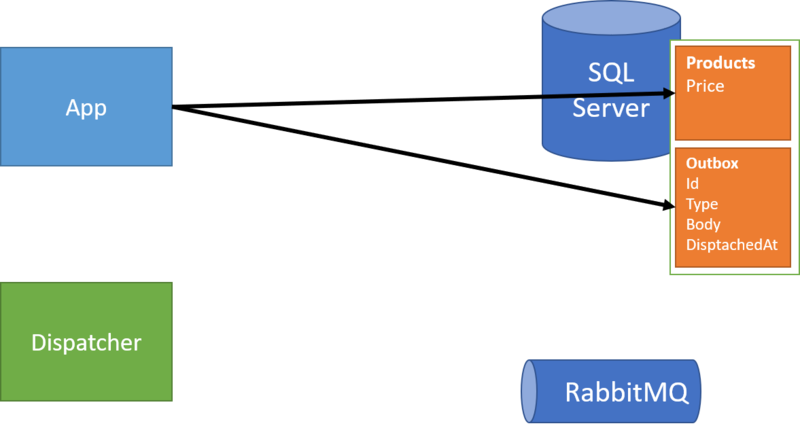 With a SQL database, our transaction scope widens considerably - to the entire database! This also widens the possibilities of how we can model our "outbox". 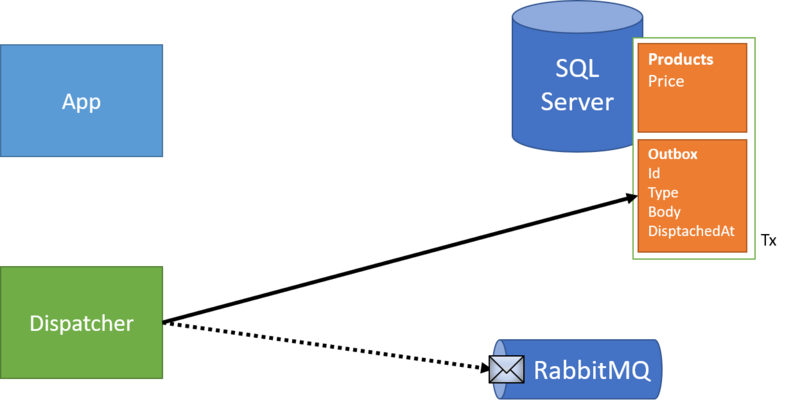 We don't have to store an outbox per record in SQL Server - we can instead create a single outbox for the entire database. We also need to keep track of what's been dispatched or not. 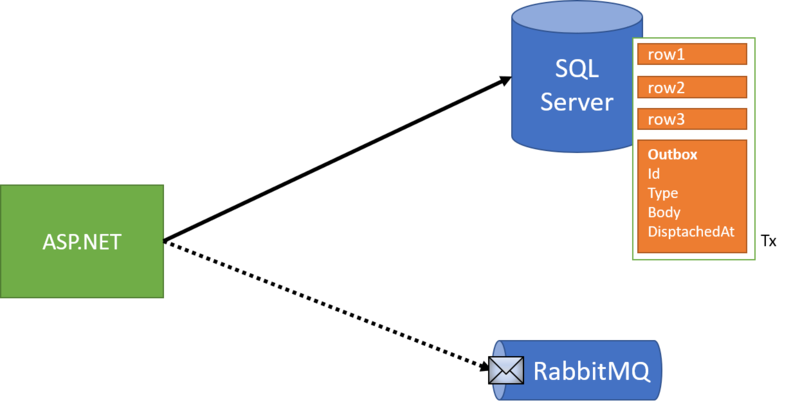 In the CosmosDB example, we keep sent/received messages inside each record. 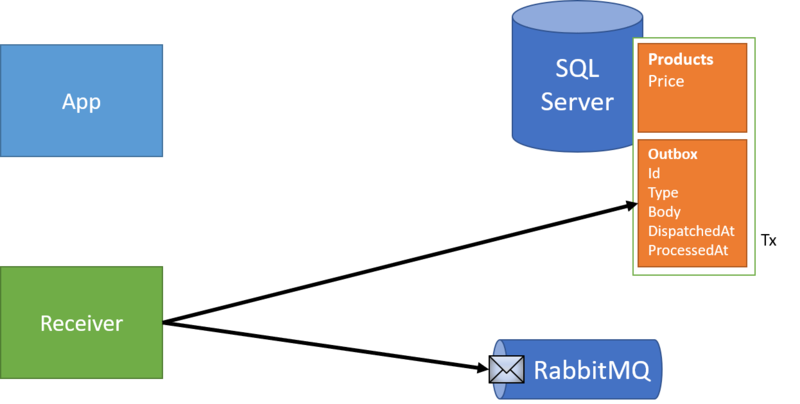 With SQL though, having a single table that grows without bound is...problematic, so we need some more information about whether or not a message has been dispatched, as well as a dispatch date to be able to clean up after ourselves. Processing the outbox will be a bit different than our original Cosmos DB example, since we now have a single table to deal with. In the Cosmos DB example, we used domain events to communicate. We can do similar in our SQL example, but we'll more or less need to draw some boundaries. Are our domain events just to coordinate activities in our domain model, or are they there to interact with the outside world as service-level integration events? Previously, we only used them for domain events, and used special domain event handlers to "republish" as service events. There are lots of tradeoffs between each approach, but in general, it's best not to combine the idea of domain events and service events. With this in place, we can safely "send" messages in a transaction. However, we still have to deal with receiving these messages twice! Similar to our inbox, we'll include the processed date with each message. As we process a message, we'll double-check our outbox to see if it's already processed before. If not, we can perform the work. If so, we just skip the message - nothing to be done! With these measures in place, the last piece is to decide how long we should keep track of messages in our outbox. What's the longest amount of time a message can be marked as processed that we might receive the message again? An hour? A day? A week? Probably not a year, but something that makes sense. I'd start large, say a week, and move it lower as we understand the characteristics of our system. With the outbox pattern, we can still coordinate activities between transactional resources by keeping track of what we need to communicate, when we've communicated, and when we've processed. It's like a little to-do list that our system uses to check things off as it goes, never losing track of what it needs to do. In our last post, I'll wrap up and cover some scenarios where we should avoid such a level of coordination.